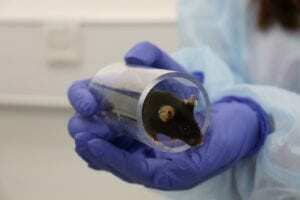 Does tail handling induce depression in laboratory mice? Mice are the most widely used species for scientific research. In order to improve their welfare in the laboratory, we need to better understand how routine practices and procedures affect them in order to make refinements to their housing and husbandry. Recent work led by Dr Jasmine Clarkson and Prof Candy Rowe at Newcastle University found that the current practice of picking mice up using their tails is associated with a depressive-like state, which is not evident in mice handled using a tunnel (Clarkson et al., 2018). The team demonstrated that mice handled using their tails were less sensitive to rewarding sucrose solutions and were anhedonic compared to mice handled using a tunnel. Anhedonia is a core symptom of clinical depression in humans and can be described as the reduction or inability to experience pleasure from rewarding stimuli. Traditionally, anhedonia has been measured in laboratory rodents by looking at how much sucrose they consume. In this study, how they drank was also considered, as their licking patterns can also reveal how much they ‘like’ something. Tail handled mice drank less sucrose and did so in shorter licking bouts compared to tunnel handled mice, indicative that they found the sucrose less rewarding. This has obvious implications for improving their welfare: building on previous studies by Professor Jane Hurst and colleagues at the University of Liverpool (Hurst and West, 2010; Gouveia et al., 2013, 2017). However, it also has implications for scientific research. Mice are commonly used for a wide range of experiments where reward is often used to train the animals to perform in a given task. Therefore, making refinements to the way that mice are handled, by using a tunnel, has the potential to improve performance, shorten training times and reduce sample sizes in scientific experiments. Taken together, the work provides more support for the adoption of non-aversive handling methods such as tunnel handling for laboratory mice, in order to improve both animal welfare but also the quality of scientific data. The work was funded by the BBSRC (BB/J014516/1) and is published in Scientific Reports (https://www.nature.com/articles/s41598-018-20716-3). Clarkson, J. M. et al. (2018) ‘Handling method alters the hedonic value of reward in laboratory mice’, Scientific Reports, 8(1), p. 2448. doi: 10.1038/s41598-018-20716-3. Gouveia, K. et al. (2013) ‘Reducing Mouse Anxiety during Handling: Effect of Experience with Handling Tunnels’, PLoS ONE. Edited by E. M. Mintz. Public Library of Science, 8(6), p. e66401. doi: 10.1371/journal.pone.0066401. Gouveia, K. et al. (2017) ‘Optimising reliability of mouse performance in behavioural testing: the major role of non-aversive handling’, Scientific Reports. Nature Publishing Group, 7, p. 44999. doi: 10.1038/srep44999. Hurst, J. L. and West, R. S. (2010) ‘Taming anxiety in laboratory mice’, Nature, 7(10), pp. 825–826. doi: 10.1038/NMETH.1500.